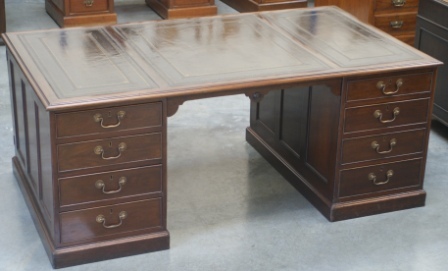 A handsome Large Antique Mahogany Pedestal Desk. c1910. Excellent tooled three panel dark brown/black hide writing surface inset into moulded top. Four drawers to each pedestal and frieze over the kneehole. Plinths to each pedestal. Reverse side has two shelved cupboards (but no drawers). Panelled sides and rear. Excellent original brass handles to each drawer. Brass lever locks with key.